A policeman visits a remote island community to investigates a missing girl. Robin Hardy's wonderfully atmospheric 1973 thriller has long been regarded by horror film fans as a genre masterpiece, and is widely regarded as one of the finest British films ever made, but it's not been seen as its director originally edited it for thirty years! 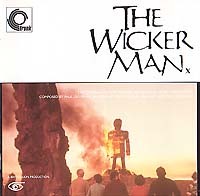 This is not the place to vent that particular tale of woe (interested parties should seek out Allan Brown's excellent book Inside The Wicker Man - The Morbid Ingenuities, published by Sidgwick and Jackson). Suffice to say that the film was severely truncated by a disinterested distributor for its original theatrical release (losing about fifteen minutes from its original 105 minute running time in the process). To cap it all, the original film elements and the negative have been lost, and it's unlikely that they'll ever be rediscovered. The film has gained a strong cult following over the following decades (its reputation in the US was aided considerably by a landmark article in a 1977 issue of Cinefantastique magazine), but during that time it's usually only the shortened version of the film (which we'll call "the 84m version") that has been seen in public. Luckily not all of the footage removed from the original edit has been lost: an almost-complete version miraculously survived in the US, (and was made available on VHS there, courtesy Magnum Video). Another longer copy (running 96 minutes, about five minutes shorter than the complete version) surfaced in 1988, and was transmitted by the BBC. 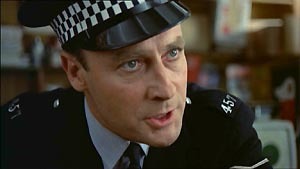 There are some minor discrepancies between these two versions: the BBC version was significantly shorter than the Magnum Video version (which featured early scenes set on the mainland before Edward Woodward's stoic Sergeant Howie leaves for Summerisle), but it did feature some relatively insignificant footage that was missing from the Magnum version! To the annoyance of many fans, even though these longer variants were known to exist, only the 84-minute theatrical cut was released commercially in the UK: the Magnum Video version was out of print, and was commanding respectable sums on auction websites. The attempts by British TV station Film Four to locate the source of the Magnum version proved fruitless, and they eventually resorted to buying a VHS copy on Ebay and, after a bit of rudimentary cleanup work, premiered this version to eager subscribers! Ironically it took an American DVD label, Anchor Bay, to finally release a home video version that did the film, and it's legion of fans, justice. 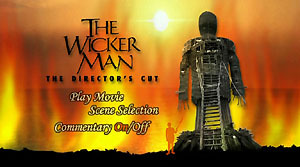 In August 2001, Anchor Bay issued the film in two different versions: a single-disc version (containing the film and a documentary), which is easily dismissed, and a much more attractive, special edition two-disc set packaged in a brick-sized wooden box, with the iconic image of the Wicker Man itself burnt into it. However, Anchor Bay's two-disc version has been superceded by a Region 2 (PAL) version that offers everything that’s in the American set, and a couple of exclusive features, too! The only thing that's missing from the UK release is the snazzy wooden box. Fans of the film from both sides of the Atlantic who bought the limited edition Anchor Bay disc should certainly consider upgrading to Studio Canal's Region 2 version (distributed by Warner Home Video). As with the Anchor Bay version, there are two versions of the film in the two-disc UK set: the abbreviated (84’02”) theatrical version of the movie, featuring a new 5.1 remix (at 448kbps), and the extended (but still incomplete, 99’40”) “Director’s Cut”, in original mono. Both are presented in anamorphic widescreen at 1.78:1. Material in the Directors Cut that’s not also in the theatrical version has been sourced from the only known source: a ropey 1” NTSC analogue videotape (there are awkward shifts in picture quality whenever there’s a switch, but it’s a small price to pay to see the film - more-or-less - the way it was meant to be seen. 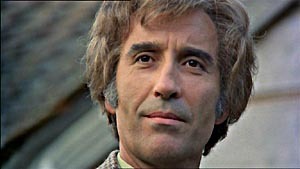 Extras on the UK and US versions include a theatrical trailer, a handful of TV and radio spots, a contemporary American TV interview with Christopher Lee and director Robin Hardy and The Wicker Man Enigma (35 minutes), a very solid documentary featuring all the key participants and some alluring footage showing the locations as they look now. 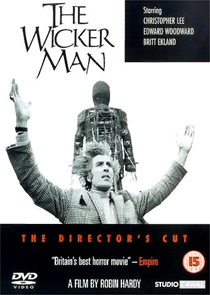 The UK disc has an exclusive commentary track, with Robin Hardy and stars Edward Woodward and Christopher Lee, moderated by film buff Mark Kermode, which contains a lot of interesting anecdotes. For fans of the film, this alone makes it worth upgrading from the Anchor Bay version. The second disc also includes a hidden "Easter Egg" feature (16 minutes), which is also exclusive to the UK disc. The film is packaged in a triptych fold-out digipack, housed in a relatively sturdy cardboard slipcase. Since it's now been out for a while, it's often available for peanuts (it's not unusual to see it for less than £10) - what a bargain! It took Studio Canal and Warner Home Video many, many years to get around to releasing the longest available version of this remarkable film in the UK, but they’ve more than made up for lost time with a practically definitive presentation. The set seems to have sold well on both sides of the Atlantic, so it wouldn't surprise me to see Anchor Bay, who might be eager to reclaim lost ground, issue yet another version, with even more extras (perhaps another commentary track, or the 1998 BBC Scotland documentary). Incidentally, there's an even more lavish box set available for about £40, containing the two-disc Region 2 release, together with a copy of the soundtrack CD, an illustrated 16-page colour booklet, a Senitype® (framed 35mm film frame) and a rolled 40" x 27" one-sheet cinema poster. 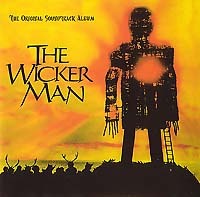 Fans of The Wicker Man should also seek out Silva Screen's soundtrack CD (FILMCD 330). The disc presents breaks Paul Giovanni's music down into two sections: Songs From Summerisle (Ballads of Seduction, Fertility an Ritual Slaughter) and Incidental Music. The former is comprised of eleven tracks. The first eight of these were sequenced by Giovanni with the intention of releasing a soundtrack album, when the film had its original theatrical run, and come from the original stereo masters prepared at the time. Tracks 9,10 and 11 were recorded for playback on set, and only exist in mono (although they've been tweaked for the CD release). The incidental music tracks have been sourced from what Silva Screen euphemistically call "various sources". The quality of these tracks is generally very good, but Silva has, quite rightly, chosen not to integrate them into the rest of the score simply to present the music in chronological order. In 1998 the Trunk label released a CD of the film's music (BARKED 4CD), which was sourced from a music and effects track (a recording of the soundtrack without dialogue, used for dubbing into foreign languages). At the time Giovanni's master tape couldn't be located (it was eventually discovered to be in the possession of the film's Associate Music Director, Gary Carpenter). The fidelity isn't too shabby, but the source was mono. The Trunk disc also omits the Gently Johnny track, since it was taken from the 86 minute version of the film, and this scene is missing from the so-called "one day" print. Both discs are marred by sound effects. On the Silva album they're restricted to the incidental music tracks and it could be argued that they're a small price to pay for what are essentially bonus tracks to complement Giovanni's album.